The Aleppo soap is a typical product of the city of Aleppo in Syria, from which it takes its name. It is a completely vegetable and biodegradable product that does not contain added preservatives, colorings or perfumes. 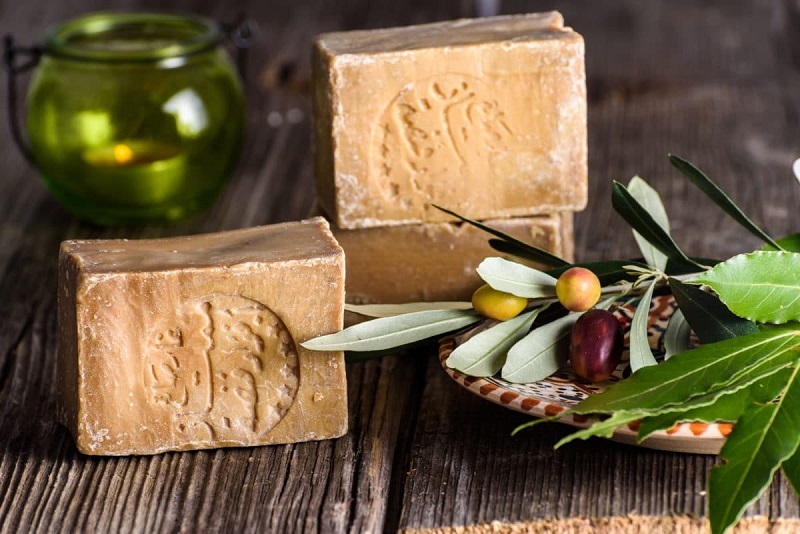 The properties and benefits of Aleppo soap are known and recognized. Among which the anti-inflammatory, antiseptic and disinfectant properties stand out in particular. It is also indicated as a remedy for fighting eczema, psoriasis, acne, and dermatitis. Testimonials dating back to 2800 BC report the use of this soap in Turkish baths, where it was applied to the skin of the body before the massage. And to the skin of the face (for a period of about 5 minutes) to obtain an effect similar to that of the beauty masks used today. In Europe, the Aleppo Soap arrives in the Middle Ages with the Crusaders. Until then, soap for washing both laundry. And hair was made from animal fat and ash. But was too strong and therefore not very suitable for the skin, as it dehydrated it excessively. In the twelfth century, this product spread to Italy. Spain and the fifteenth century in France, particularly in the Marseille area. Thanks to the presence of important olive groves. Became the center of production of the homonymous soap. Which is, therefore, the heir direct to that of Aleppo. In the nineteenth century, when olive oil was replaced by copra oil or palm oil, soap became a common, low-priced, mass-produced consumer product. The climatic characteristics existing in Aleppo are essential for the success of the soap making and seasoning of the soap. Today, due to the dramatic events in Syria in recent years, the production of the Aleppo Soap has been transferred to Antakya, a suitable area of Turkey situated about 100 km as the crow flies from Aleppo. 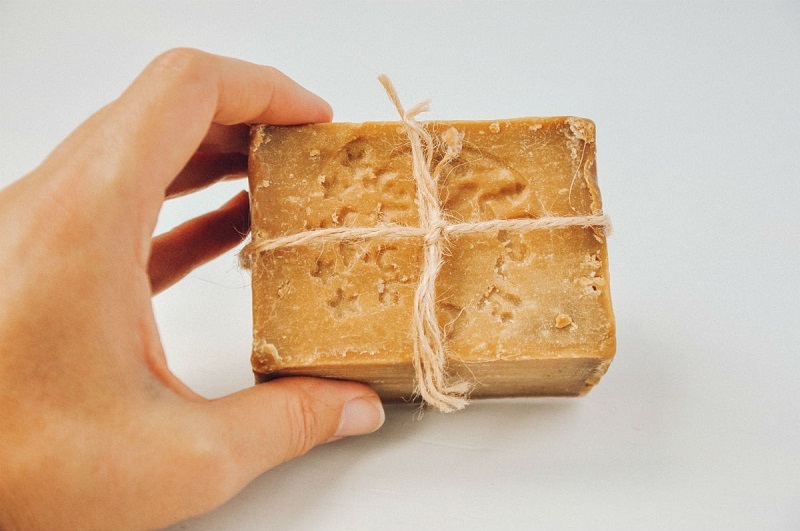 Even today the Aleppo soap is manufactured in a traditional way according to a recipe that has been handed down unchanged for centuries, of which versions are already known in the 7th and 8th centuries. In addition to vegetable soda, the traditional recipe also includes olive oil and laurel berry oil, which are also very common in Syria. It is precisely the bayberry oil that largely explains the beneficial qualities of this soap. To identify a good quality product, it is, therefore, necessary to pay attention that it really contains olive oil and laurel oil, and not palm oil or coconut oil, or worse still copra. Must contain: 10-70% of laurel oil; 30-80% of the content must be olive oil and 0.5% maximum of lye. It is a hot saponification process. Traditionally, olive oil is cooked for a few days in large stone containers buried in the sand with the addition of lye. Only at the end of this slow cooking, which lasts several days, do you get a thick soap paste, to which is added the oil obtained from the bayberries, which give the soap its particular fragrance and its emollient properties. The amount of laurel oil, varying between 10% and 70%, determines the price (because it is a particularly expensive product). Laurel oil gives antiseptic, purifying and anti-inflammatory properties, while olive oil has emollient and hypoallergenic qualities. After this procedure, Aleppo soap is transferred for several weeks into tanks for solidification. The product is then cut into blocks and left to dry for a period of about 10-12 months. Just the natural drying and oxidation produced on contact with air, give Aleppo soap its typical brownish-ocher color. – Shampoo: It is ideal for washing hair and is excellent dandruff. It can be used up to twice a week. – Acne: Soothing, antiseptic and disinfectant, it can also be used on skin with dermatological problems, such as acne or eczema. Obviously, this is not a definitive solution to fight acne on the face. But it is perfect for skin with a fat body tendency (such as the back and shoulders) because it normalizes it. – Dry skin Helps rebalance the natural hydro-lipid film of the epidermis and nourishes the driest skin. If applied for 3-4 minutes, it has a smoothing effect like that of a cosmetic mask. – Oily skin: It has a purifying and balancing action on the skin. Which makes it an effective treatment for oily skin. The Aleppo soap works on long-term training of blacks points until they disappeared. But in the short term, excessive cleaning may weaken the problematic skin. – Psoriasis: Relieves skin problems such as psoriasis. It has no effect on inflammation or the many factors involved in this condition, but it can slightly soften the plaques on the surface, making them less hard, hydrated and less irritated. – For babies and children: Thanks to its gentle formula, it is suitable for all skin types, even the most fragile ones, such as those of the little ones. – For the beard: It can also be used as a shaving foam thanks to the ability of the laurel seeds to stretch the skin and open its pores for a large amount of foam it produces. – For the laundry: It can also be used for laundry, especially the delicate one like silk. Simply wet the Aleppo soap with hot water and rub it directly on the dirty part. Leave to act and then rinse. Better to use the 12% laurel oil, cheaper for this use. – Against moths and woodworms: It can be used as mothproof and woodworm. Because it has the same action as mothballs and gives the garments a pleasant aroma of laurel.